In 2 meetings held last week the discussions produced a plan for monthly competitions to be held. The aim of the competitions is to strengthen player development and assist with the national beach soccer team’s preparation for regional and international competitions including the Oceania Football Confederation (OFC) beach soccer world cup qualifiers next year. While a full schedule for the competitions is yet to be finalised SIFF can confirm that the plan is to hold a competition during the final week of each month involving 8 teams. Two (2) of the eight teams shall be composed of players from the national team training squad. The matches are to take place on Saturdays and Sundays with cash prizes to be given to the winning teams. The first series is expected to take place this month and registrations will be announced later in the week. Team manager of the national beach soccer team, Bilikiki, Reuben Oimae, and assistant coach, Gideon Omokirio are spearheading the initiative with support from DJ Graphics Ltd. The SIFF competitions department is also involved in the planning and will be mostly responsible for managing the monthly tournaments. 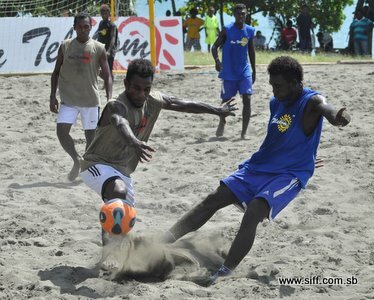 Oimae describes the tournaments as vital for the preparations of the national team for the 2013 FIFA beach soccer world cup qualifying competition. “The national team has been training but we need to have such tournaments to ensure that the players are sharp and well conditioned. As we have learned from the recent national beach soccer championship, local competitions are a hotbed for breeding talent and we need to sustain them so that the player supply to the national team is maintained,” Oimae says. The issue of player supply is also another area that the discussions between SIFF and DJ Graphics Ltd. touched on. Already positive signs are showing for a beach soccer school of excellence for young children to be established and run at DC Park which is owned by DJ Graphics Ltd. Coordinator for the beach soccer school of excellence, Omokirio, says that such a program needs to be quickly set up so that the foundation for beach soccer can truly take hold. “Grassroots development is the key for future success. Once we start at the pikinini (kids) level we will continue to enjoy beach soccer success in the years to come because we will have a constant supply of players,” Omokirio says. The beach soccer school of excellence program will be run by Omokirio and fellow national team players and will be held on Saturdays. An announcement on the registration process for the beach soccer school of excellence will be made at the end of the week. The program targets 10 – 12 year olds and will held each Saturday from 7:30am to 9:00am.